Yossi Milo Gallery is pleased to announce an exhibition of recent abstract photographs by Alison Rossiter, entitled Reduction . The exhibition will open on September 23 and close on October 30, with a reception for the artist on Friday, September 24, from 6:00 to 8:00 pm. This will be the artist’s first solo exhibition at the gallery. Alison Rossiter’s photographs are created without a camera on expired, vintage photo paper. The artist experiments with gelatin silver papers she collects from throughout the 20th century, making controlled marks by pouring or pooling photographic developer directly onto the surface of the paper. 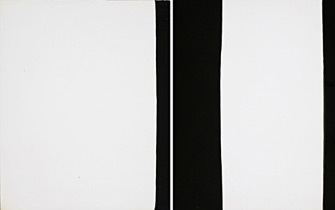 Dark forms emerge which often resemble mountainous landscapes or active tornados; other shapes are paired by the artist to create minimalist diptychs. Each batch of gelatin silver paper, such as Eastman Royal Bromide, which expired in 1919, or Nepera- Velox, which expired in 1906, possesses unique qualities, depending on its particular color, surface, condition and age. Utilizing her experience in conserving photographs, Ms. Rossiter reacts to these variables and manipulates the interaction of paper and developer by hand, paying tribute to the intrinsic qualities of photographic materials and reintroducing unpredictability into a process which is now commonly digitized. Alison Rossiter’s photographs are in the collections of major public institutions, including the Art Institute of Chicago; the Philadelphia Museum of Art; the Minneapolis Institute of Arts; the Museum of Fine Arts, Houston; the Milwaukee Art Museum; the Museum of Contemporary Photography, Chicago; the Center for Creative Photography, Tucson; and the J. Paul Getty Museum, Los Angeles. Ms. Rossiter was born in Jackson, Mississippi in 1953 and currently lives and works in the New York metropolitan area.